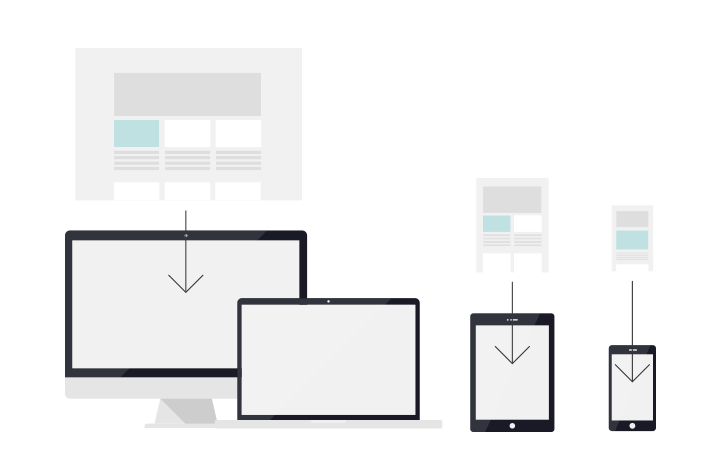 Responsive vs adaptive web design: which is right for your UI design? Responsive web design vs adaptive web design: which UI design makes for the best user experience and conversion rates? Find out here! In a multi-device, multifaceted-user society, UX designers face increasing pressure to keep users happy and connected 24/7. Luckily, there are loads of web design tools at our disposal to keep on top of this. In fact, with so much variation, it can sometimes get a bit overwhelming. Responsive web design, adaptive web design, flat, material etc. The UI design principles behind responsive web design and adaptive web design are quite different, so how do you know what’s best for your interface? Which you choose totally depends on you and your web or mobile product. Getting informed, with our post below, is a great start. But the most important thing is how you apply what you’ve learned. Our advice is to design your solution through prototyping, with a tool like Justinmind, so you can test out both concepts early on. Justinmind responsive prototypes are here to save the day! But first, let’s get you informed. Responsive web design (RWD), accredited to Ethan Marcote, describes a website’s content and layout appropriately designed to fit the screen of given devices. Responsive web design is achieved by using CSS media queries and HTML to resize, hide, shrink, enlarge, and/or move the content to make it look good on any screen. RWD’a features include fluid grids, flexible media, and breakpoints with a fluid layout between them. We’re living in the days of mobile-first, and we can’t always anticipate which device our users are going to use. As a result, a staggering number of today’s newer sites use responsive web design in order to cater to the multitude of users of today. But why should you use responsive? Readability: Responsive design delivers a single design that has slight variances from device to device. The intention is to offer an overall universal look and feel without users having to zoom in and out of differently sized screens on their various devices. Fluidity: in Responsive web design, all components buttons, menus bars, images etc. are automatically scaled downed in order to respond suitably to the design features of each device. This feature makes for an unchanging experience no matter which device you’re viewing a design on. Bonus: RWD is super easy to implement in your interactive prototypes with Justinmind! To learn how to design responsive prototypes with Justinmind, click here. Responsive web design: what’s the catch? 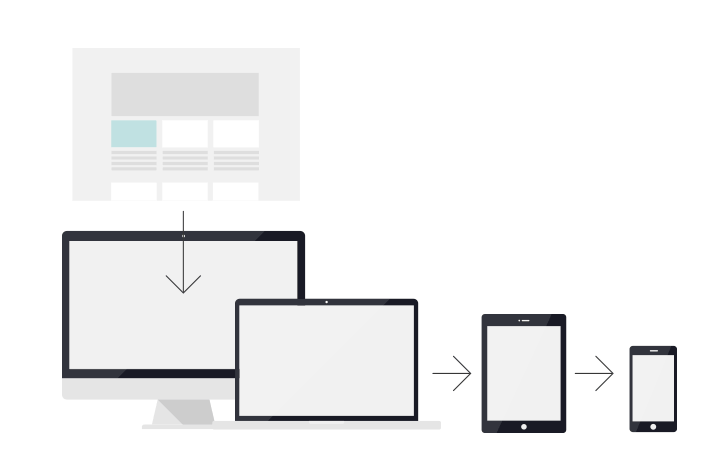 Here’s the thing: Responsive requires more work. To make sure that the webpage fits each screen that users access, you will need a substantial amount of programming and coding. And then there’s the effects on the user and their experience. RWD mixes up content in each screen so that it can fluidly fit everything to the size and shape of the device’s window. Taking special care of the visual hierarchy of the design, this is also true for Adaptive, as it is shuffled around, as well as whether all that content is suitable for mobile devices is key. Oh, and be prepared for longer page load times and incompatibility with older browsers. Adaptive web design (AWD), the term coined by Aaron Gustafson, describes content authored and layout designed for distribution across multiple channels, media, products and interfaces. This design is achieved through progressive enhancement, detecting the device, and static layouts. Bonus: Adapative web design can also be worked in to your Justinmind prototypes! To learn how to design adaptive prototypes with Justinmind, click here. In both responsive web design and adaptive web design, the layout of the UI is reworked to accommodate the size of the screen. But whilst responsive web design responds to the size of the browser interface by fluidly adjusting the placement of elements on a web page to best fit the available space, adaptive web design adapts to the width of the browser interface at specific points, based on the size and capabilities of each device. Whichever web design works for you, there are no shortcuts to effective UX design. No UI designed with responsive web design or adaptive web design is going to be one-size-fits-all. Starting your design process with a low-fidelity wireframe or prototype is the best way to fail forward and ensure you end up with the best possible UI design. So what are you waiting for? The Justinmind responsive and adaptive features will help you achieve this quickly and easily. Download Justinmind now and see what we mean!